This workshop examines ideas of radical incrementalism across our towns and cities. It seeks to explore theories and practices that can support emancipatory change across urban regions through the power of urban dwellers to challenge poverty, oppression and unjust environments. 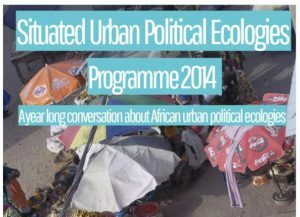 Such actions and processes take place within and beyond the state and suggest important ways to evaluate prospects for socio-ecological equality across infrastructures, everyday life and the wider urban condition. This workshop is part of a series of conversations that form a collaborative investigation into developing situated ways of undertaking urban political ecology. Each session focuses on different dimensions of critical approaches to urban theory and brings together scholars from different disciplines whose work explores critical understandings of processes of socio-ecological urbanization. We have 17 confirmed participants who will provide a series of keynotes and shorter provocations to support the open debate nature of the workshop. Speakers include: Malini Ranganathan (American University, Washington D.C.), Mark Swilling, University of Stellenbosch, Edgar Pieterse (ACC, UCT), Laurence Piper (University of Western Cape), Andrew Charman (Sustainable Livelihoods Foundation), Jonathan Silver (Durham University), and Henrik Ernstson (ACC, UCT). The workshop starts at 14.00 on Thursday 23rd of October with an afternoon session and keynote by Edgar Pieterse. This is followed by a full day of workshop sessions between 9.00-16.30 on Friday 24th of October, covering the following themes: “Outlining a radical incrementalism in theory and practice”; “Articulating a radical incrementalism”; “Experiments across infrastructures”; “In and beyond the state”. Main organisers is Henrik Ernstson and Jonathan Silver with support from Edgar Pieterse. Erin Goodling (Portland State University) will function as rapporteur for this workshop. This post is cross-posted from African Centre for Cities, University of Cape Town and please go there for details on venue, how to participate and readings. There are still some seats available for students and scholars. The workshop is an initiative by the Situated Urban Political Ecologies Collective (#SUPE) and the African Centre for Cities, University of Cape Town. It forms part of SUPE Year of Conversation 2014.